With all the talk about grand New Year's Resolutions, I have an easy idea for you. 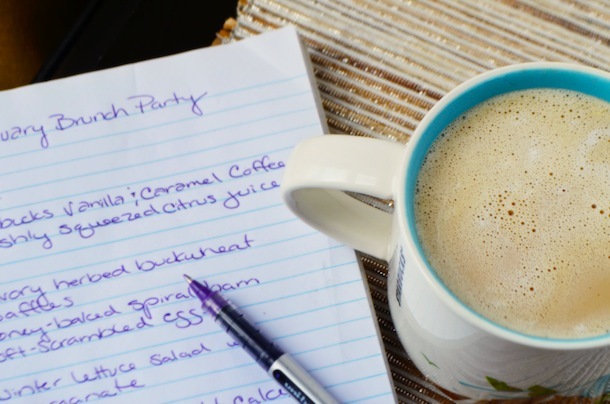 Pick out a day in early January--maybe one day during that first or second weekend--and invite a few friends over for a cozy winter brunch. Here's what we're going to do: Call up the friends that you meant to meet up with during the holidays, but never got around to seeing. And the ones you wish you could have spent time with, were you not out of town visiting your own relatives. And it'll be the New Year, after all, so take risks. That guy at work you've had your eye on? Or that neighbor you always wave at, with whom you'd like to become friends? Why not?! Make this the year you go for it--no better excuse than brunch! What I love about entertaining after the holidays, is that the pressure is off. It's a blank slate and yours to do with what you'd like. So let's do something, fun, OK? I'm excited to have partnered with Starbucks to host a casual little get together for my own friends and family in early January. It's going to be a low-key brunch--think cozy sweaters, big mugs of coffee, and a menu of simple, comforting dishes. 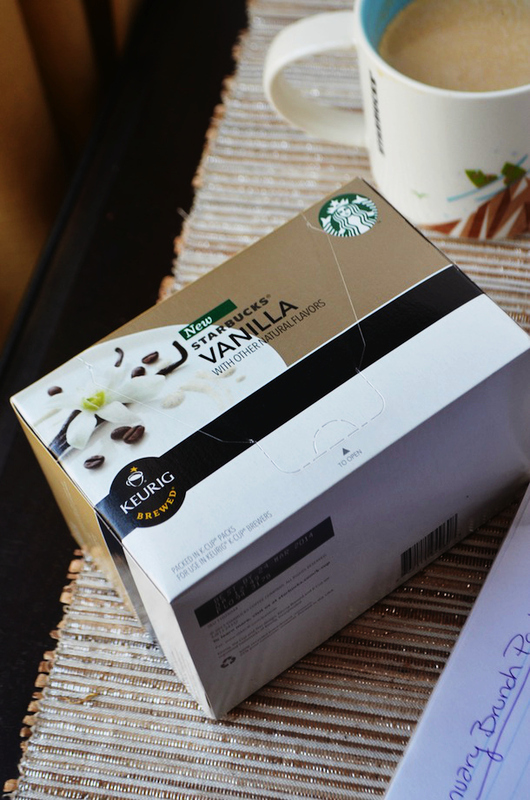 I'll be serving coffee from Starbucks new line of flavored K-Cup packs, which come in Vanilla and Caramel flavors. I love how easy it is to just pop the little K-Cup in my new Keurig® Special Edition Brewing System, and have a mug of freshly brewed coffee ready in seconds. 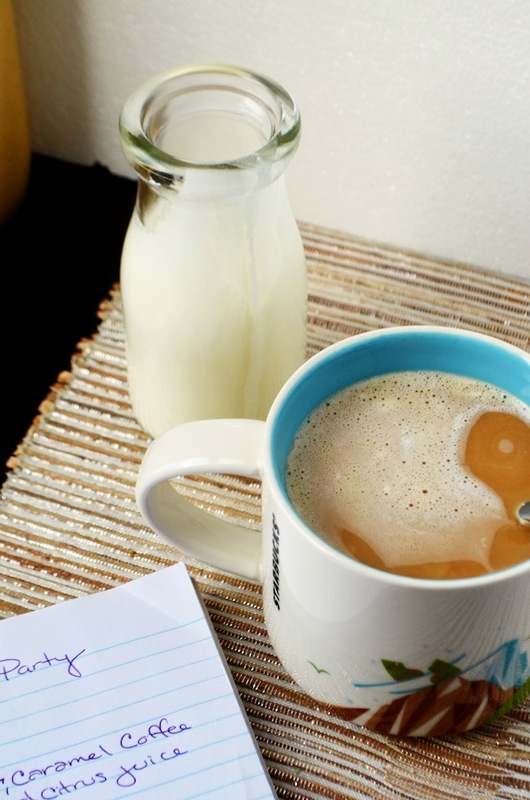 Starbucks K-Cups are perfect for entertaining because it makes it easy to serve each guest a perfect cup of Starbucks coffee in his or her favorite flavor or blend. Seriously...it's like having my own little coffee shop right at home! Oh and bonus: They make my apartment smell incredible! Eugene actually came home while I was making myself a mug of the Starbucks® Vanilla K-Cup®, and asked if I had a cake in the oven. That is how good this coffee smells! As far as the menu goes, the idea is to keep it casual and simple, but just a touch more exciting than the usual weekend breakfast. 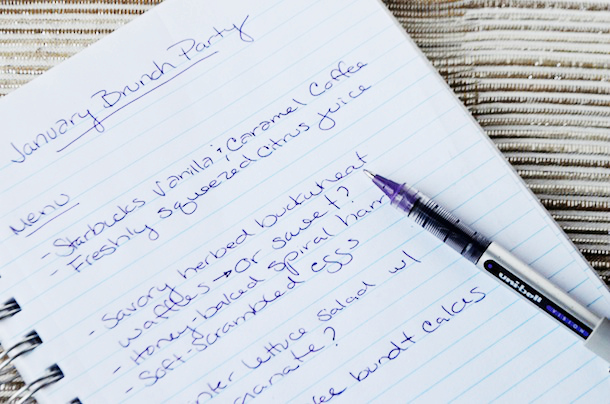 I suggest figuring out your usual favorite brunch dishes, and then adding a simple twist. Instead of plain orange juice, serve a blend of citrus juices. You can make them freshly squeezed if you have a juicer, or just buy a variety of the best quality juices you can find at the store (look for the kinds with pulp) and mix them up in a big pitcher or carafe. I love to combine grapefruit, blood orange, lemon, and tangerine for a bright, tart (and pretty!) beverage. Waffles or pancakes are a classic, but why not change it up a bit by using nutty buckwheat flour instead of the regular kind? Or add in a handful of finely minced fresh herbs for a savory twist on the traditional. Something green is key (it's January, after all), so think about salads you can serve. I love a big mix of peppery winter leafy greens topped with sliced apples and pomegranate seeds. You can also add roasted root vegetables or candied nuts to make it a little extra special. And (most important of all!) dessert. My plan is to pick out a simple cake recipe--maybe a coffee cake or a vanilla pound cake to pair with the Vanilla flavored coffee--and bake it in mini bundt or muffin pans. People love individual portions--especially in January when they're trying not to overindulge. I hope this has inspired you to invite a few friends over and host your own winter celebration. Here's to a new year filled with special moments, flavors, and people! This post is sponsored by Starbucks K-Cup Packs. Thank you for supporting great companies like Starbucks. that make it possible for me to keep creating fun new content for you to enjoy. All photos, opinions, and ideas are (of course!) my own.